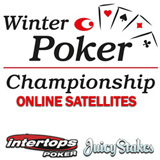 Intertops Poker and Juicy Stakes Poker frequently send online poker players to major live tournaments in Europe and the Caribbean. This month you can win your way to the prestigious Winter Poker Championship in Seefeld, Austria. Online satellite tournaments begin on Wednesday. Win the Final in the three-tier tournament series and you'll receive a $4,000 prize package that includes €2160 buy-in to the Winter Poker Championship Main Event (February 24th to 26th), premium accommodation in the Tyrolean ski resort, and travel expenses. Seefeld is a picturesque village in the heart of Tyrol, an area that has twice hosted the winter Olympics. Players from all over the world will compete for an estimated prize pool of $800,000 in the thrilling three-day No Limit Hold’em event. There will be lots of daily cash games for those who can’t tear themselves away from the tables. But there are also lots of other ways to enjoy the picturesque medieval village including skiing, horse-drawn sleigh rides, ice skating, sledging or a spa visit.